For folks who pay attention to FFE, yes, I'm that Don McKinney... legacy Traveller errata, Mongoose Zhodani book, etc. My local gaming group wants to return to HERO, but the last time we all played was 4th. Looking to combine my T5 and other efforts, since everyone but me wants to give HERO a new shakeout. So, is there anyone who has done some preliminary work on converting TH to HERO 6th, and is there enough interest that I would start collecting TH errata/material. Sadly, I know a TH CD is not an option. But I realize that licensing costs and the miniscule size of the potential TH market make that a virtual impossibility. Already discussed with Marc Miller (and Kevin Walsh), and now with Jason at HERO. Note that I don't do dates or financials for Marc, but what I can say is that we're looking at a document that would both provide errata for the existing Traveller HERO material, and assist in converting the existing Traveller HERO material to work with HERO 6th edition. As far as the state of the Third Imperium in T5... Understand that while T5's published default is Golden Age (1105), the FFE plan moving forward is to have the clock restart post-1248. 2. What elements of the published Traveller HERO books were problematic, and would benefit from reconsideration/rework. And yes, this does stem from those I game with really wanting to get back to HERO, so if someone could point me at a "differences between 4th and 6th edition" and "how to convert 4th edition to 6th edition", I'd be grateful. You can start with the 6E and CC conversion documents. own for HD though of course. 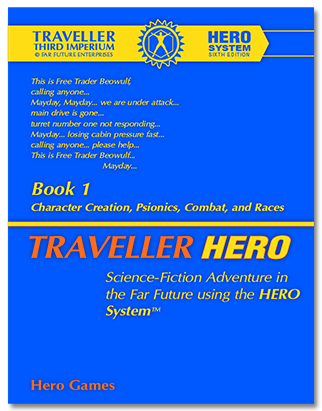 I'm excited about the prospect of a new version of Traveller Hero for 6e. We're working on it. The worst of the difficulties have been agreed to. A Darker Blue might work and a more Red and Yellow Lettering. Well, let's face it, tradition kinda demands that the cover be all black with a thin horizontal stripe, some spartan text and not much else. I can't really lobby against that with any sincerity since I think a venerable brand like Traveller has earned the right to maintain its distinctive look. I just thought it would be fun to see what the cover might look like if it was a 6e Core Library volume. If I might make a suggestion/request: remove any references to/dependencies on Terran Empire or other Star Hero sourcebooks. "For Senators and Representatives, use the Senator package in Terran Empire, page 108, but change the major contact to the appropriate leader." Followed by a conspicuously missing template box for the Senator professional template. Maybe. But to my mind, this isn't simply a case of accidentally leaving a table out of the book. It is a case of the authors choosing by design to leave out material and make the reader consult other books they may not have (and, IMO, shouldn't need). The example I provided (the Senator template) is not an isolated case; there are other externally-referencing templates, and no doubt numerous other bits and pieces of setting content described as being part of the Traveller universe, but absent in detailed game-data form because some semblence of it exists in books like Terran Empire or Alien Wars. Well, I hope you won't be similarly constrained this time around. The items that the book(s) tell you to go find elsewhere appear to the uninformed reader as utterly arbitrary and bewildering. Mind you, I expect many settings details to be left out simply due to space constraints. It sort of makes sense that "for more information" on many things you would have to turn to JTAS articles or something. At least those are actual Traveller books, out of print though they may be. But being directed to a completely unrelated setting book (like Terran Empire) feels much less sensible to me. I got all the electronic books and Hero Designer packs that were out there for the public for TH, but missed out on the physical books! Actually I've had a chance at some of those floating around too, but just haven't had the money yet. Anyhoo, if the Hero 6th edition license is cheaper (free? ), maybe there could be a Print On Demand for a TH6? We're still nailing down the details. What Marc Miller is working on at the moment is a TH CD, which would incorporate all the existing TH materials, along with a reference/conversion document for incorporating T5 ideas into HERO 6E. IF we can do that, then he's potentially open for more. But that's the first step. I too am late to the conversation, heard from Kevin and Polaris recently. It's been a while, so my memory of the various issues and constraints is somewhat murky. Psionics, I had no information in the Traveller source material to use as a gauge on what the energy use (END/REC) would convert to, so the END rules were best guess. Profession templates - as Kevin already said, we couldn't reprint the existing material, since it's owned by HERO. Races - again, can't do an direct reprint of the existing material, since someone else owns it. I do remember someone commenting we should have included a method to randomly generate characters and their backgrounds the way Traveller does. I didn't think about it at the time, HERO is about spending points to build what you want and Traveller was about random, so I went with HERO, since it was Traveller HERO. But all in all I think it turned out fairly well. Sounds like Don and Kevin and group are making progress with Marc Miller on making things available again, so fingers crossed. A perfectly reasonable approach, IMO. Right, well, that's when you come up with your own take on the Traveller professions rather than referring readers to a book that you can't quote and which they may not have. Races - again, can't do an direct reprint of the existing material, since someone else owns it. Wait, what? Marc Miller doesn't own the rights to the alien races in his own game's universe? I do remember someone commenting we should have included a method to randomly generate characters and their backgrounds the way Traveller does. I didn't think about it at the time, HERO is about spending points to build what you want and Traveller was about random, so I went with HERO, since it was Traveller HERO. For what it's worth, I think you made the right choice there. You are absolutely right, it was Traveller Hero, where the only thing really being borrowed from Traveller was the setting, not the mechanics. Having been markedly disappointed with T5 thus far (as a RPG. It is a very lovely gaming universe builder), and liking the traditional Traveller feel, I'd very much like to have something like this come out, since I missed the original TH era.